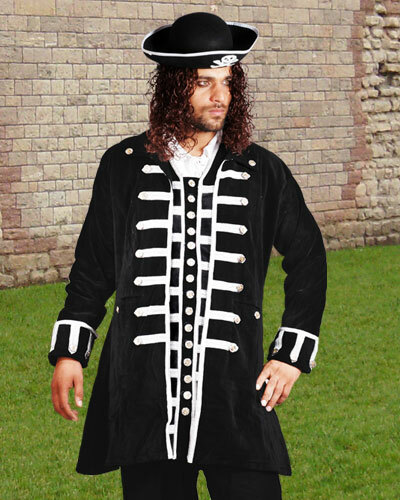 This black cotton velvet pirate captain's vest has style to spare! Rich, silver braid and button trim in the Napoleonic style. 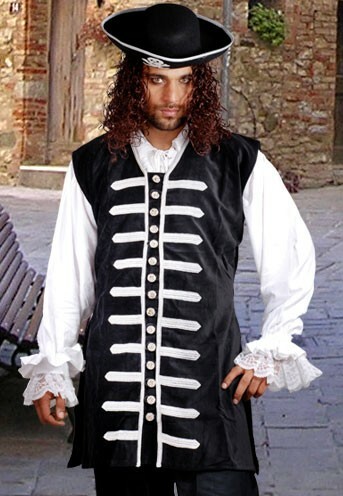 Combine this striking vest with a fine white shirt like the John Calles pirate shirt pictured here, and you'll cut a fine figure at the next Ren Faire. Sizes to XXXL and X-Tall (see size chart). John Calles pirate shirt sold separately. Hat is not available. Chest 42" 44" 47" 49" 52" 52"
Waist 36" 38" 40" 42" 45" 40"
Length 46" 37" 38" 38" 40" 42"